"There's just no other opportunities out there. Chris and his guys are fun to work with and very serious about success! I want to work with a guy who knows what hard work is all about, Chris Lafferty and Lafferty Motorsports is where it's at!" 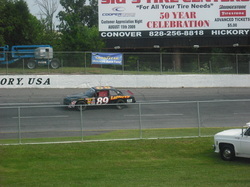 Ted raced in the ARCA Series for Lafferty Motorsports and continues to serve with Lafferty Performance managing accounts. "WOW! I always hoped for this opportunity and here it is!" Russ Dugger, from Tulsa, Oklahoma, made his NASCAR Camping World Truck Series debut in 2008 at Phoenix International Raceway. Russ was now running with the big boys of NASCAR, and it all started with a phone call to Lafferty Motorsports! "I always wanted to race and never had the opportunity. 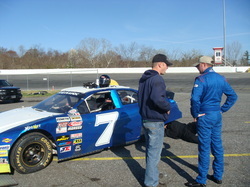 Thanks to Lafferty Motorsports, I got to race in the NASCAR street stock division." Are you ready to become the next success story? Contact Lafferty Driver Development and get started today!